In 2018, Disneyland introduced special after-hours themed events called Disneyland After Dark. The two themed events, “Throwback Nite” and “Star Wars Nite” were huge hits, selling out quickly and bringing in a ton of extra revenue for the Resort. Plus the events give us something that is much needed at the Resort – an experience created for the adult Disney fan. These events aren’t officially marketed as events for grown-ups, but let’s face it … a late night, after-hours party until 1am? With themes such as Throwback Nite and Sweethearts Nite? It sounds like a good excuse for adults to get out of the house, leave the kids with a sitter, and enjoy Disneyland without the massive crowds. 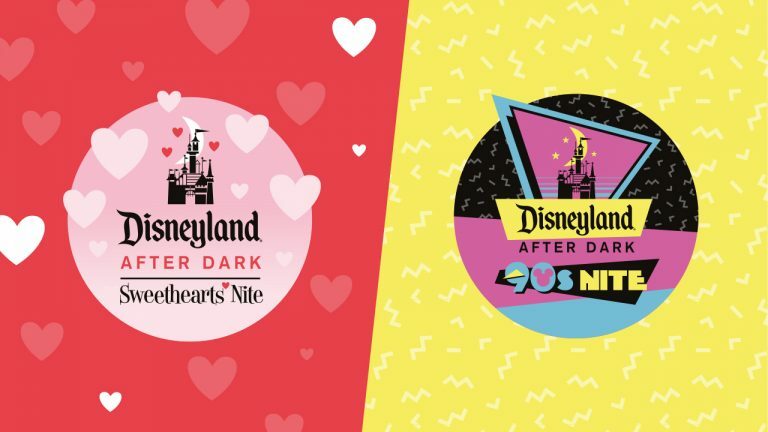 The events were incredibly popular last year, so it’s no surprise Disneyland After Dark is back in 2019 with two new themed events: Sweethearts’ Nite and 90s Nite. Sweethearts Nite will take place on February 7, 2019 from 9pm to 1am. The event officially starts at 9pm but guests with a ticket can enter Disneyland Park as early as 6pm. Disney is encouraging guests to “don a darling outfit inspired by your favorite Disney Character” so expect to see a lot of cute couples Disneybounds at this event. Special offerings will include rare character “Disney couples” encounters, romantic themed photo backdrops, a “ball” near It’s a Small World, and specialty menu items. During the special event guests can also enjoy a showing of Mickey’s Mix Magic, the new fireworks show for 2019, and access to select attractions and shops. Guests also receive a souvenir lanyard, event-specific guide map, and complimentary PhotoPass downloads during the event. 90s Nite will take place on March 7, 2019 from 9pm to 1am. The event officially starts at 9pm but guests with a ticket can enter Disneyland Park as early as 6pm. Obviously everyone is going to want to rock their old 90s fashion! Special offerings will include an “exclusive” fireworks show, 90s themed photo backdrops, rare character encounters – including some favorite from The Disney Afternoon – a “totally fly musical cruise” on the Mark Twain Riverboat, 90s-style menu items (not totally sure what that means, are they bringing back Orbitz? ), and access to select attractions and ships. Guests will also receive a souvenir fanny pack, themed guide map, and complimentary PhotoPass downloads during the event. The cost for each event is $99 per ticket. * Children under 3 years are free. There is no AP discount, but AP pre-sale tickets start November 27, 2018. General tickets are on sale November 28, 2018. Visit the Disneyland website to learn more and purchase tickets. 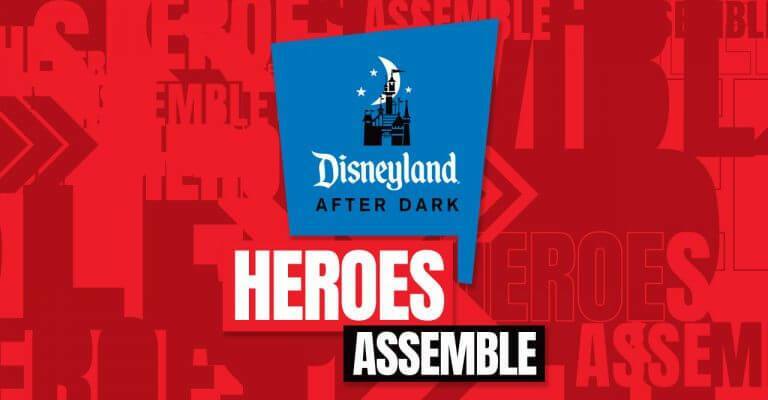 Heroes Assemble is the first after-hours event at Disney California Adventure! The two dates for this event are April 30 or May 1, 2019. There will be character greetings, entertainment, a dance party, scavenger hunt, photo ops, special menu items, and more! Guests are encouraged to cosplay but please adhere to the guidelines as noted on the Disneyland event website. It is noted guests will also receive a “keepsake” but no other additional information is available at this time. The cost for this event is $109. Annual Passholder pre-sale will be February 19, 2019. General public tickets will be on sale February 21, 2019. Visit the Disneyland website for more information and to purchase tickets. Availability for these events will be limited and they WILL sell out. So plan ahead and get your tickets early! Wondering what it’s like to attend a Disneyland After Dark event? They are probably very similar to the after-hours Annual Passholder events Disneyland used to offer to Annual Passholders for free a few years back. You can read about my experience with these events here. Do you plan on attending a Disneyland After Dark event this year?